About a week ago, I went over my writing income for 2014. 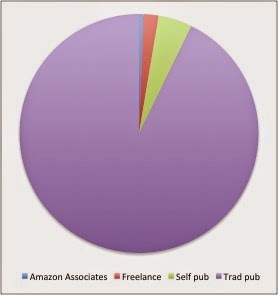 Since I find it interesting when other authors post about their earnings, I thought I'd post the distribution of my income from different publishing channels. 2. Lord of Time (short story) sold to Inscription Magazine (September) and self pubbed after exclusivity window ended (December). Also made available for free to new mailing list subscribers (sign up at www.liviablackburne.com). 3. Poison Dance in backlist. Permafree from April through November. So I don't feel comfortable posting exact numbers, but here's the distribution for my income. As you can see, I'm still making the vast majority of my writing income from my traditional advances (92%). I've not yet gotten a royalty statement for Midnight Thief, so I don't know how close I am to earning out there. Self pub accounted for about 5% of earnings this past year. Income from freelance articles (magazine sale) and blog advertising made up the remaining 3%. Amongst my self pubbed titles, Poison Dance was the top earner, with more than 2/3 of the earnings coming from the print edition. This was partly because the ebook version was free April through November. Also, there's a higher profit margin for the POD edition ($4.14 per unit for amazon sales, about half that through other channels) compared to the ebook version ($0.35 to about $0.80, depending on vendor). Since taking Poison Dance off of free in December, sales of Midnight Thief have gone down, and monthly earnings from Poison Dance have gone up roughly 70%. Of my self pubbed titles, only From Words to Brain has earned out its production expenses. The other two titles are still several years from earning out, according to current sales levels. Hope that's helpful! Let me know if you have any questions. Thanks for sharing that information, Livia. Quite interesting.